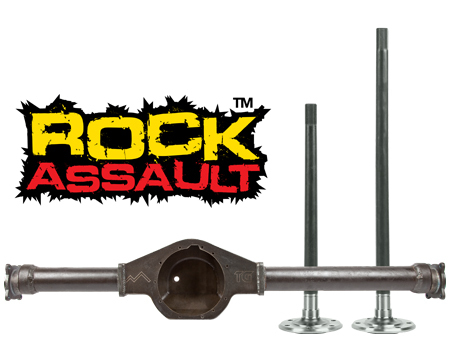 The Samurai Rock Assault™ Axle Housing Kit is a Toyota IFS width axle housing that is offset for a Samurai t-case. This housing features a heavy-duty, press formed, 1/4" plate steel center section shell that is specially shaped to ensure a minimum of 3/4" additional clearance under the differential. The differential mounting surface is made from 1/2” plate steel and comes with our Differential Stud Eliminator Kit to ensure that your differential never pulls out of the housing. The outer offset flanges are made from 4130 chromoly to prevent distortion or bending. Axle tubes are made from 1/4” thick DOM tubing, with a 3” outer diameter. This exclusive design features axle tubes that have been offset above the housing center line. The inner axles ride near the bottom of the axle tubes rather than in the center. The results are an increase of 3/8" ground clearance under the axle tubing. The center section is offset to line up with the Samurai t-case so that your drive-line does not vibrate from being offset. This housing uses a Toyota 8" differential.